Herman Toothrot, a character from the previous game, is sitting in a camp to the right. After landing on the island, click anywhere on the play area to regain control. Pick up the bottle on the edge of the water and bash it against the rock to the left of the still. Go into the jungle on the left and take the left path. Use the broken bottle to break the hanging bag at the dead end. Pick up the box and return to the rock at the beach. Pick up the martini glass on the ground beside the still, fill it with ocean water, distill it, and use the glass o' distilled water with the box to obtain two crackers. "Head due east from the pond to the dinosaur." "Head north from the dinosaur to the pile of rocks." "Head due east from the rocks to the X." When you arrive to the Big X, use your shovel on it, light the dynamite with the matches, and throw the lit dynamite into the hole. Tie the rope around the crowbar, and use the crowbar 'n' rope on the twisted metal rods above. After regaining control, use the light switch (as indicated on the image to the right). From now until the end, LeChuck will try to use the voodoo doll to teleport you to a random underground room every time he finds you, and there is a limited time before he does. Use the map below to navigate quickly; every room on the top row can only be accessed from the room below it. The objective is to collect the five ingredients necessary to create a voodoo doll: underwear, crispy beard bits, a used hankie, a skull, and a generic voodoo Kewpie doll. Attempt to pick up Dad's remains (i.e. the right skeleton) to obtain a skull. Open the medical drawer on the right and pick up the hypodermic syringe. Open the trash can beside the medical drawer and pick up the stuff inside for two surgical gloves. Open the four openable boxes on the floor, and take a balloon and generic voodoo Kewpie doll. Inflate the balloon and both surgical gloves using the green helium tank on the left. Push the coin return on the Grog vending machine. Pick up LeChuck's underwear when he bends over to pick up the dropped coin. Pull the lever when LeChuck shows up at the door. This will not work if you do not have two helium surgical gloves and a helium balloon. Gather the crispy beard bits on the floor. Because this is the only location that is safe from LeChuck, take the opportunity to put all the ingredients you have into the juju bag. Find LeChuck and quickly give him the clean, white hankie. Place the used hankie into the juju bag. 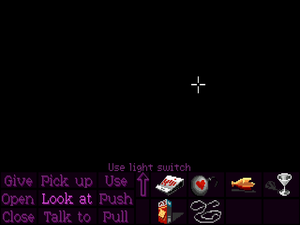 Find LeChuck again and use the hypodermic syringe with the generic voodoo Kewpie doll. Follow him into the next room. This page was last edited on 23 May 2009, at 20:37. This page has been accessed 30,279 times.